If I post a belly pic will you all act like I blogged today? See I can't find my desk, it's buried under mail, and bills, and things to be photographed and recycled (kids artwork) and things to find a home (we just re did our office). We are also re-financing, which means I have two years of paperwork to go through. Oh and my kids? Not getting back in the swing of it...it was a toothbrush in an un-flushed (do any kids flush?) toilet sort of morning (yes, again). Oh and I am currently on a business call. So let's pretend this is a post, m'kay? If you want to read something I was featured on Mamapedia yesterday or you could go read this exciting announcement on what's coming up this week. *It's the curse of the third child. I will probably also never know how old he/she is. Also, I wish I pulled back my sweater so you could see how low this baby is, I need to get one of those belts because seriously, OW in places I can't write about (family read this!). So cute! Love belly shots. I never know how old my third is. I even didn't notice I was pregnant with him for a while. 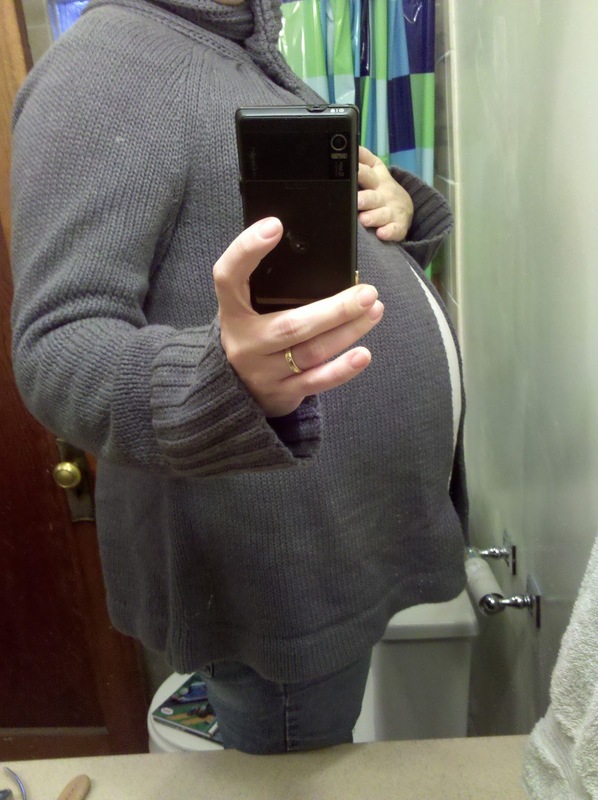 So my due date ended up being almost 2 months off at first. Oops. I agree with Kate up above I love posts like this one! I'm so ready to see baby pictures! Good luck with refinancing! My parents did that once when we were all little--it was crazy hectic! So extra good luck with that!